Gaining flexibility means saying yes to more opportunities. The Fortus 360 builds parts in three different materials for more options in prototyping, tooling and digital manufacturing. 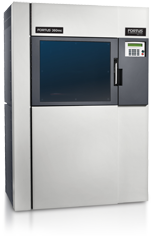 This machine produces accurate, durable, repeatable 3D parts with great throughput, so you can be just as agile with low-volume manufacturing as you are in product testing and development. he Fortus 360mc 3D production system comes in two configurations: the basic system, which builds parts as large as 355 x 254 x 254 mm (14 x 10 x 10 in. ), or an optionally upgraded system that builds parts as large as 406 x 355 x 406 mm (16 x 14 x 16 in.) and features two material bays for maximum uninterrupted production. With four layer thicknesses to choose from, you can fine-tune your desired balance between FDM’s finest possible feature detail and the fastest build. Fortus 360mc throughput is 70 percent higher than on the Fortus 250mc, so you can further compress your design cycle, work iteratively and increase production.